It’s 8:58 and I’m already late. Lucky for me, I can be at work in only 2 blocks time. But in my race to arrive on schedule, and as I exit my apartment and pull the door to slam it shut, my flimsy full length mirror slides from its unstable perch and falls to the floor. I have 200 tiny little pieces and seven years of bad luck to contemplate. As I painstakingly pick up the shattered slivers, I start to wonder about the reality of that old wives tale. Legend leads us to believe that a mirror not only reflects our outfits, but actually steals our soul. And when we New Yorkers run around with no time to spare and crowd our oh-so-tiny abodes leading to living room liabilities– we not only bump into and break our mirrors but we damage our destiny in the dealing. Since our cells and our souls are said to regenerate every 7 years, I may have several seasons of unseemly events to sort through. Feeling like I could use a little luck, I went in search of a cure to combat my curse. I had hoped for a Ladybug landing or even a penny in my path, but no such luck. And unfortunately, the only wishing well I know is 2 hours east of here on Mill Race Road in my hometown of Hampton Bays. Finally, I found a food that would force my good fortune to return. Ancient Chinese tradition hints at the historical significance of rice as a source of good luck – which is one of the reasons we sprinkle the seed ceremoniously on the bride and groom. To combat my 7 years of instability, I must attempt to harness the healing and restorative recources of rice. 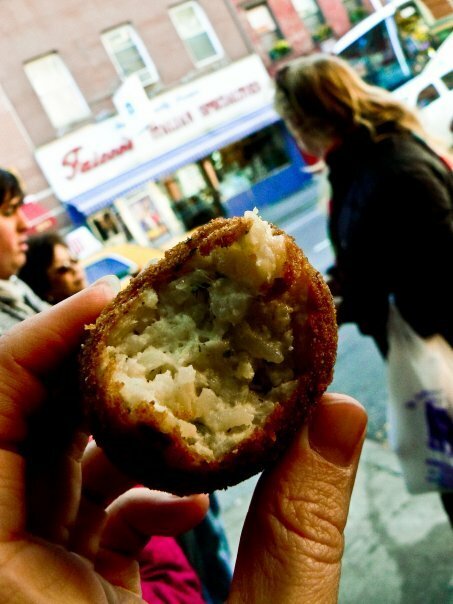 But in my Italian neighborhood of Greenwich Village, the only suitable starchy seed to secure is the one found in the rice-centric Sicilian Arancini. 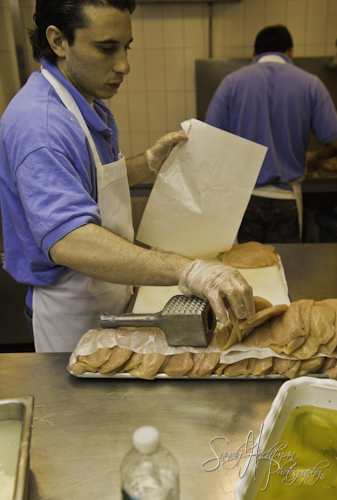 I spent last Thursday making Italian Rice Balls at Faicco’s Pork Store at 260 Bleecker Street. And without that full length mirror to monitor my appearance, the 10 hardworking and honorable hunks at Faicco’s must fill the gap. Indeed, Faicco’s is the only place I know that a self conscious single girl can walk into feeling a little uneasy and alone and, after a few supportive smiles, can walk out feeling like the loveliest lass in the village – and without a mirror in sight. With my luck ready to run out and a rainstorm about to arrive, I step into Faicco’s small space and walk safely over the sawdust covered blue and white checkered tile floor. The soft yellow streamers hung from the ceiling serve to brighten this grey day. 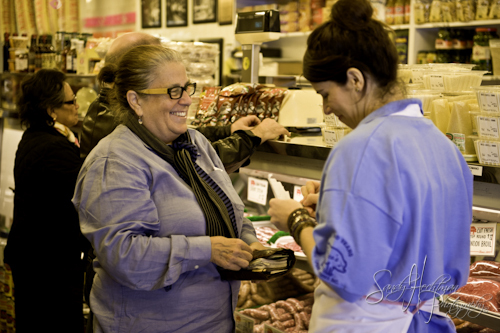 I’m compelled to step further into Faicco’s by the calling of the clear glass cases featuring house-made sausages in Sweet Italian, Hot Italian and Plain Sweet Italian – although there is nothing plain about the sweet Italian on the other side of the counter. 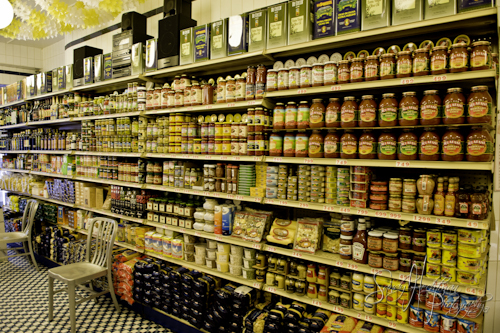 I have entered an old time meat market that has been holding its own for over a hundred years. I am the only female in sight and the staff seems eager for my arrival. I have never felt more welcomed. Judging by the line of ladies that forms around lunchtime for Faicco’s famous Italian Special Sandwich, I am not the only one who feels at home here at Faicco’s. 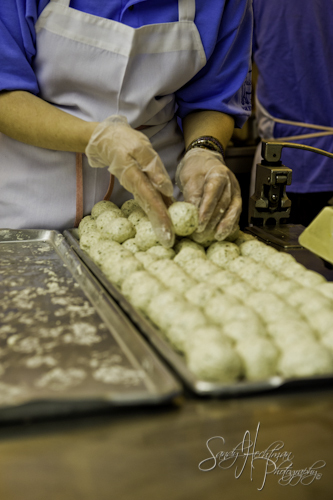 Carefully sidestepping the considerate compliments from Faicco’s baby-blue-shirted cast of lovable characters, I immediately go to work– hoping my rice ball creation will revive my fortune. 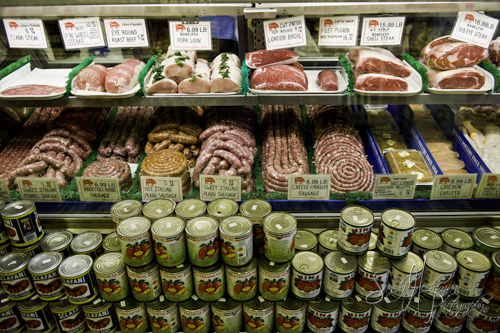 I walk past the display cases filled with Pork Chops and Pinwheel Steaks and skip over the shelves lined with everything from anchovies to artichokes and escape to the secret space in the back of the shop. As I round the corner I get a glimpse of the coveted rice ball propped up like a pyramid behind the old-school-style sign. 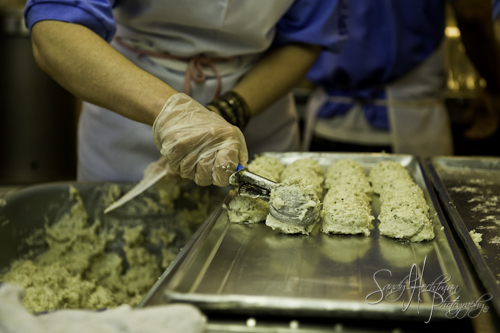 I only hope my rice ball preparation will yield equally appetizing results, and provide a little luck to spare. In fact, I’m already starting to feel just a little luckier than I did a few hours earlier. I’m about to be schooled by the chief of the shop. 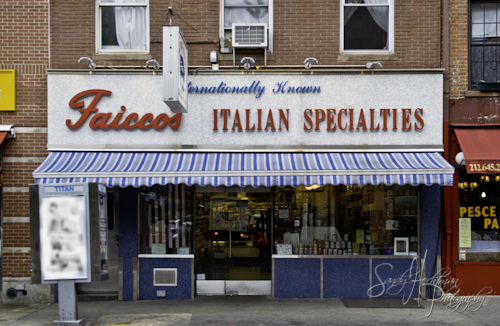 In a city of shiny facades and false fronts, and with so many avenues filled with awnings advertising the names of absentee or non-existent owners, here at Faicco’s, there actually is a Faicco – and his name is Eddie. By my side to teach me the tricks of his inherited trade is the ever popular Eddie Faicco – leader of the pack and owner of the shop. Faicco’s sells nearly 600 rice balls on their busiest day so I’ve got 600 chances at salvation. I have no time to waste. Eddie advises me as we combine our cheese-lovers trifecta of fresh ricotta, chopped mozzarella and grated romano. We mingle the mix together and add a sprinkling of seasoning: salt, pepper and parsley. Next, I suffer through the long process of laboring over 10 pounds of long grain carolina rice. Julio and I keep the flame low and the mixing to a steady speed. If we burn the bottom, our entire pot of rice is ruined and we’re all out of luck. For 15 minutes we steadily stir as each turn of the wooden paddle becomes a struggle to complete. Our only saving grace is the timed 10 minute break while we wait for our rice to thicken. Julio and I return to our mixing madness, combining the cheese trio with our ready rice. Eager to glean some luck from each grain – and while Julio isn’t watching – I sneak a taste as I bring the fantastic formula into the fridge where it will cool and become ripe for rice ball formation. With Julio on hand for advice, and Eddie always an earshot away, it’s time for Franco and me to mold each ounce into a full tray of 85 perfect portable bites. 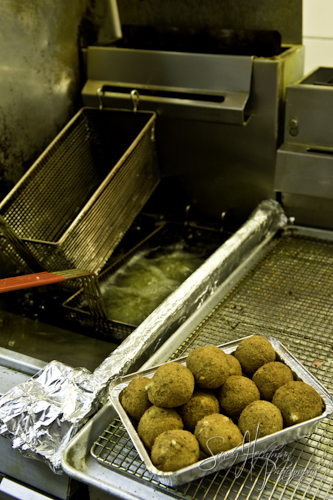 We drench them in egg wash, shower them with bread crumbs and dip them in the deep fryer. 85 down and 215 to go to complete today’s rice ball requirements. Franco works fast and he works hard. But according to him, he has a debt to repay to the ‘best boss in the world.’ As we round off those rice balls, Franco – with the passion of an Italian – fills me in on how he is forever indebted to Eddie Faicco. When Franco asked Eddie for a job, it became instantly clear that he didn’t need anyone new. But since Eddie has the biggest heart on all of Bleecker Street, he took him on anyway. Maybe these rice balls are lucky after all? Not only does Eddie take on the lost, lonely and unlucky, but he buys us breakfast every morning as well. 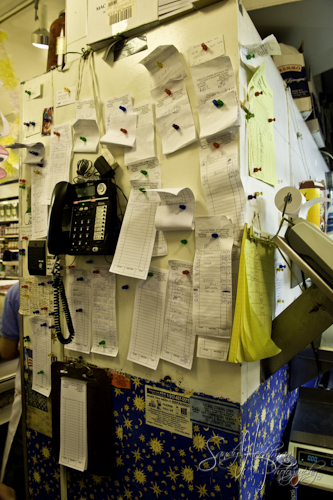 In these tight quarters in the back basin of Faicco’s, it’s difficult to tell where one worker ends and another begins. They finish each others task and do so with speed and a smile. I’ve rarely seen 10 guys so talented and attentive. But then again, the father of this ‘family’ is worth working hard for. 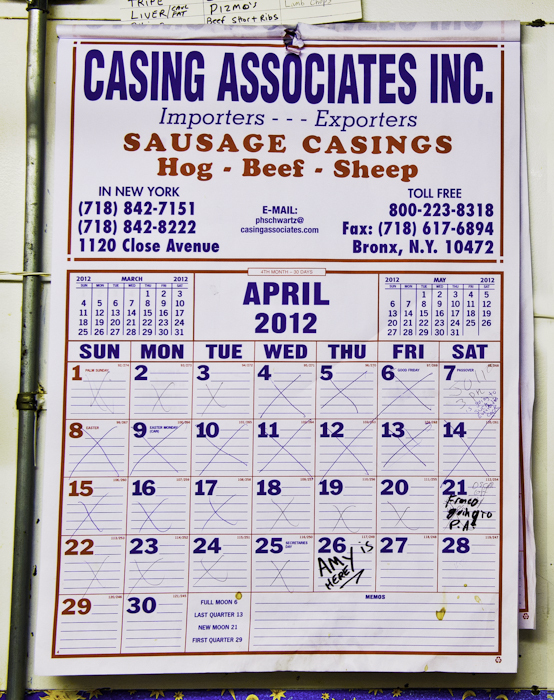 Eddie Faicco’s family arrived in America in 1897 and they opened Faicco’s Pork Store 4 years later. Eddie’s Great Grandfather (Edward) passed the store down to his Grandfather (Joseph) who handed it to his Dad and Uncle (Joseph and Edward) who proudly passed this shop and their Brooklyn store on to Eddie and his two brothers. 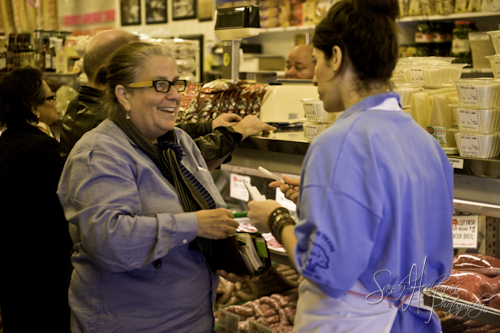 And if you arrive at Faicco’s on a Saturday afternoon, you might just see the next generation ready to force Eddie into early retirement: daughters Jillian and Gianna are always eager to stock the shelves and serve the sea of customers. Just like his daughters, Eddie started his work behind the counter at age 7. He began with one simple task: to crack open their Green Sicilian Olives with a wooden mallet. It was an all day affair. He’d place the olives upon a butcher block, which was worn down from repeated use, and crack each one of the 100 pound pail. 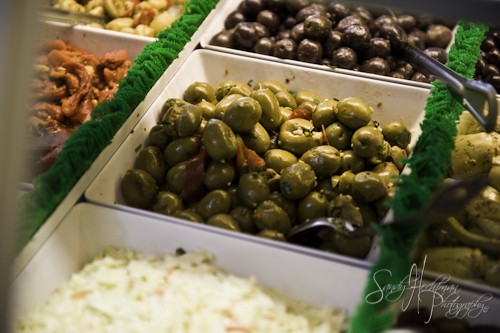 Olives are often cracked so that they can absorb the curing materials faster resulting in a fuller flavor. After all that cracking, Eddie’s olives were bathed in oil, fresh garlic, chopped parsley and crushed red pepper. And since they’re cracked open, all that goodness can seep inside. I started thinking about my cracked mirror back at home and the poor luck that was predicted. The word cracked reminds us of broken-mirror-bad-luck and of step-on-the-crack-break-your-mother’s-back childhood rhymes. And looking deeper, I discovered the mid-15th century meaning of the word cracked to be defined as Mentally Unsound, Unstable, and Insane. But after one bite of Eddie Faicco’s Cracked Sicilian Olives, I started to think that cracking up and breaking the mold might not be so bad. I may have some shattered shards of glass waiting for me back home and I may not always follow a predictable path free of zig-zag nooks, crannies and cracks in my timeline, but in my mind and for my life, these dents and seams seem to provide the most flavor. Faicco’s seems to support this very same philosophy. A few cracks and seams in it’s only-timely atmosphere only make for richer rewards. 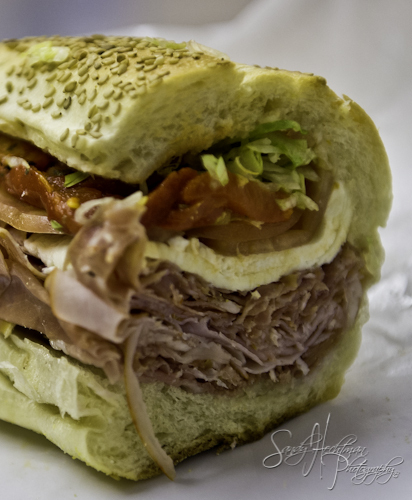 And while their sandwiches and other italian specialties are always top notch, Faicco’s sees no need for a shiny new makeover. This shop is one of the few you’ll find in New York City that is still filled with warm souls not fake smiles, real people not unnecessary artificial attitudes. Here you’ll find a personal touch as evidenced by the handwritten signs hanging everywhere and the absence of many modern technologies and corner cutting techniques. 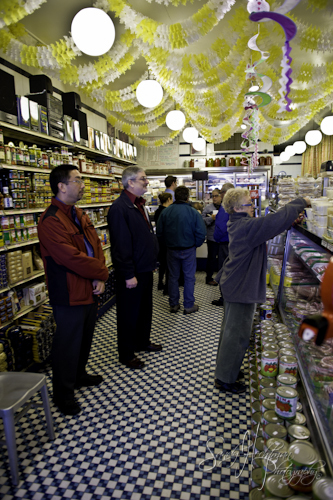 Faicco’s serves as a model for so many newly opened shops attempting to appear old fashioned. But this deli is the real deal. Faicco’s is one of the few in NYC that has achieved an utterly effortless authenticity, absent of any pretension or pomposity. but what about the bad luck? and you are safe to walk on through. I believe it. Sort of. Wicki is an intriguing character and someone worthy of tracking down and talking to some more. She’s grounded yet mysterious and mystical and by some miracle she handed me a Poem in Your Pocket that provided some insight into my recent search for lucky charms and superstition solutions. Maybe all my work with those rice balls has instantly paid off. Maybe my dear Wicki and her pocket poem was sent to foster my faith. I’m starting to feel a little bit lucky to have met Wicki and mostly, to have worked with my Faicco’s friends… but only time will tell what the next seven years have in store. I suppose the luckiest landing of all is that I currently reside in this fair city and only a few paces from Faicco’s front door. 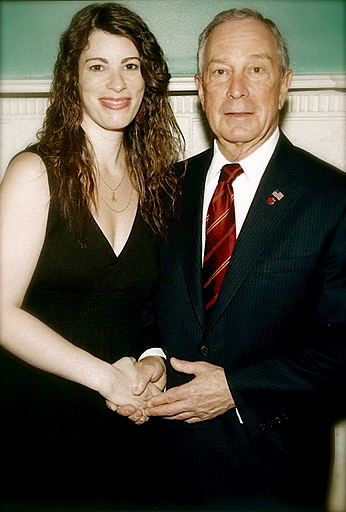 As my friend Mayor Bloomberg put it best, 50.5 can’t be wrong. 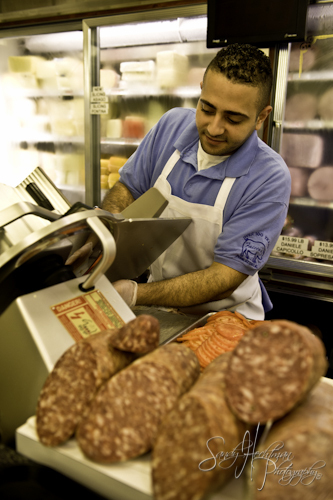 Be sure to pop over to Faicco’s at 260 Bleecker Street in NYC and say hello to Eddie and the gang. You’ll be instantly transported back in time and with one bite of NYC’s tastiest rice-centered treat – you’ll start to feel a little bit lucky yourself. Hey there, fella! Lady, hey! Where best to celebrate this whole affair? Take in the town—there is so much here to do! 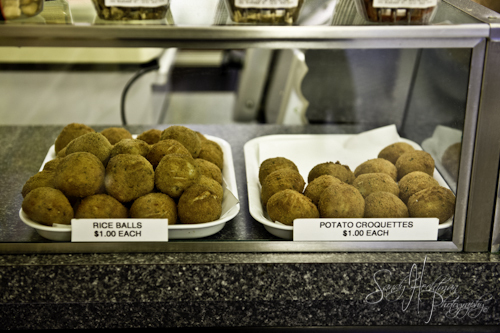 ~Rice balls and story brought to you… lovingly… by Amy Bandolik. I just read you new Rice Ball story at Faccio’s. My family has rice balls at every important holiday and celebration. It is a given. In my experiences of rice ball tasting from every pork store and pizzeria that crosses my path, I have learned that they can be as different inside as the many faces you may meet on the streets of New York. They are all delicious and, of course, fried. How can you go wrong?? from barbara & toby frm fla remember us loved this blog you are so talented see you in dec save us a dinner nite !!!!! !